There are many reasons to build a deck and just as many things to consider before starting your project. Building a deck can not only offer your family more outdoor living space, but it can increase the value of your home. But it takes planning, factoring in your budget and determining which types of decking will work best for you. This guide will teach you about decking materials and help you map out the ideal plans for your new deck. Your yard’s current look: Don’t draw your final plans until you have looked around your yard to see if anything needs changing. Pay particular attention to the terrain, soil and weather influences of your landscape. Unleveled or sloping terrain can make your decking project more complicated but not impossible. Loose, sandy soil is great for gardening but may not provide the sturdiness needed to reduce erosion and provide lasting stability. 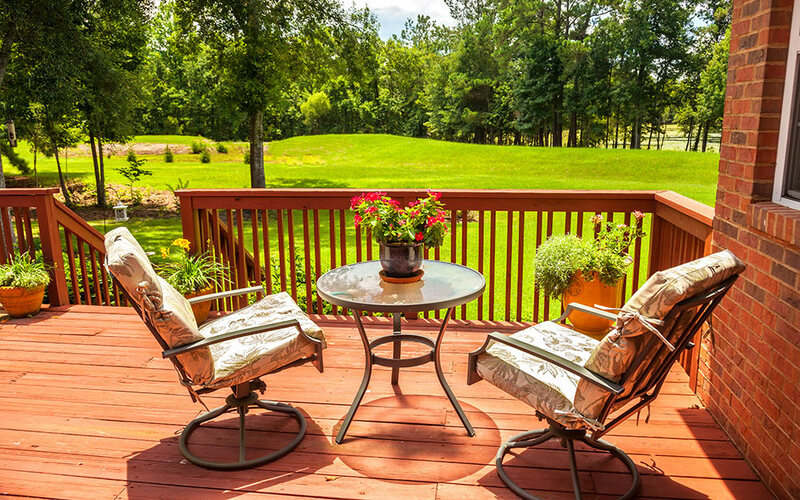 Determine why you want to build a deck: Determine why you want to build a deck: Are you hoping to extend living space or add an entertaining area outside for dining? Or is it more for gardening or pool privacy? Climate: Areas of direct sunlight, shade or wind can affect how frequently you use your deck and your comfort level. Make sure you are mindful of the weather elements at play and make adjustments for climate control. An awning, pergola or umbrella can help to shield you from the elements or provide shade. Location: The size of your lot will play a big role in where your new deck is located. The view you wish to have from your deck and the proximity to your house will also be determined by the location you choose. Budget: Before planning, be sure to factor in the size and design of the deck, any extras such as railings, flowerbeds, the choice of material and whether or not this will be a DIY project, or you will hire a professional. Design: Keep in mind that single platform decks are usually easier to build and are more cost effective. Raised decks will require extras like railings and more structural support for safety. Building codes: It’s important to check your local building codes and have your blueprints approved by the city or county prior to getting started. Always check what your local building permits and codes are before beginning a project like this. Footing: Typically made of concrete, these underground components support deck posts. Joists: The elements that make up the deck’s horizontal frame. Piers: Above ground, concrete support posts. Ledger: Attaches to your house to support one side of the deck. Flashing: A protective layer that prevents water from entering the space where your deck connects to your home. 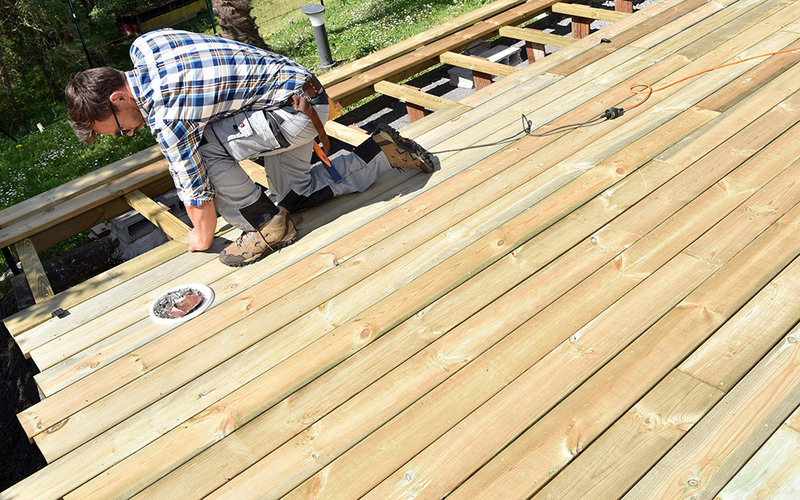 Decking: The boards used to form the floor of the deck. The look and design of your deck surface will hinge upon the materials you use. Which decking material you use will ultimately depend on your design preferences and your budget. Pressure-treated wood: The most affordable and highly durable, wood decking is easily customizable in that you can choose from cedar to redwood and easily stain to your preference. Maintain wood decks by pressure-washing and regularly staining and sealing. 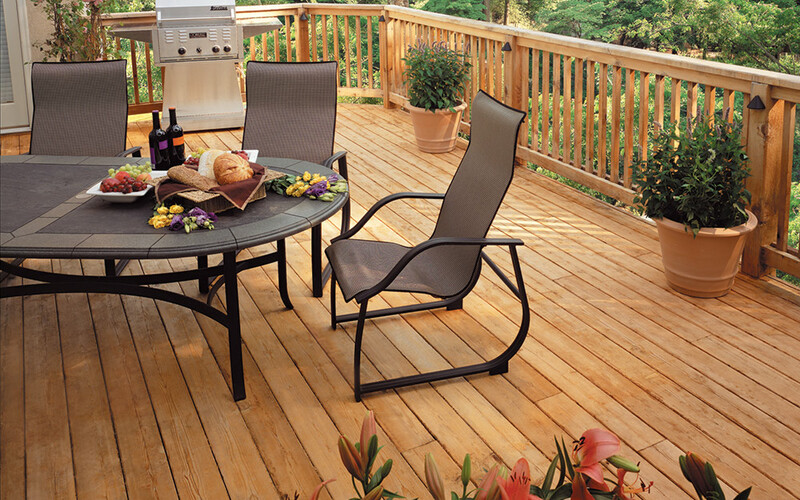 Composite decking: Plastic and wood, composite decking allows you the best of both worlds. Scratch-resistant and easy to maintain, composite is also resistant to termites and doesn’t warp. Although it does cost more than wood decking, composite only requires cleaning with a hose and doesn’t need to be stained or sealed. 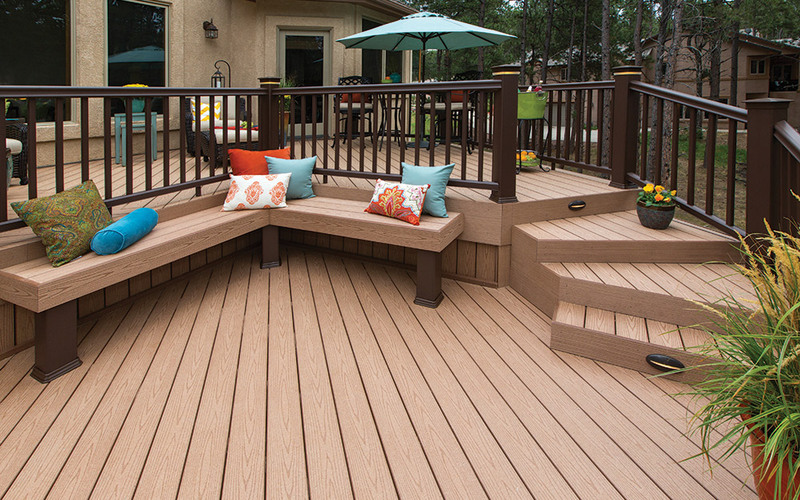 PVC decking: One of the most low-maintenance options, PVC is an all-plastic material that will not scratch, crack or splinter. It also will not require stain, paint or sealant and will not be affected by termites. You shouldn’t pressure wash PVC, but you can easily clean it with soap and water. Deck tiles: An interolcking system that allows you to create custom patterns on your deck surface. Deck tiles can be made of composite or wood. Deck extras and structure: The materials you use for railings, stairs and enclosures is extremely important. Depending on your deck plan and design, you will need to keep these elements in mind. Railings: Typically, the material you choose for your deck should also be the same material you use for the railings. Wood is the most common option. Stairs: While your stair landing should be made of concrete, deck stairs are made from pressure-treated lumber called stringers and feature a few components (hangers, risers, treads and railing). While you can cut your own stringers, custom-built stringers may save you time and energy. A well-designed deck should be an expression of how you live. 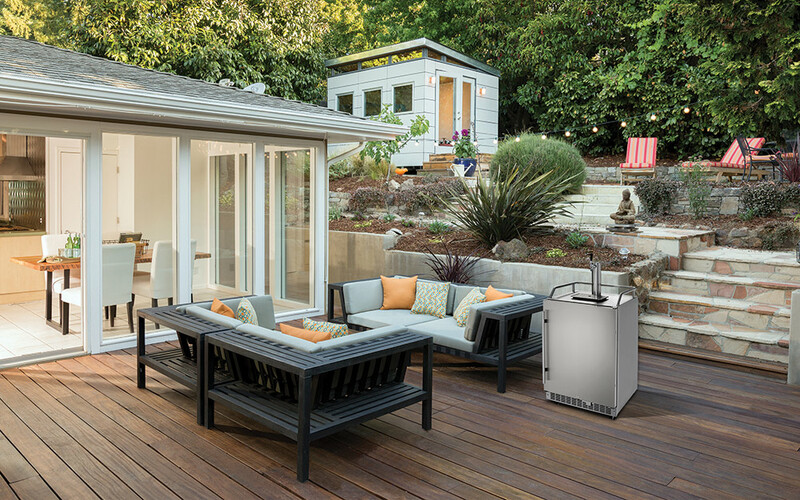 Its style, size and decorative details should match your taste and fit the way you and your family use the deck. Beyond that, your deck should complement its environment – its location in your landscape, its connection to your home and the natural elements that surround it. When it comes to deciding how large your deck should be, follow this primary guideline: Make your deck large enough to comfortably handle all the activities you want to take place on it. Start with a sketch. You’ll need enough room for the activity itself, traffic flow through and around the area and outdoor furniture, which tends to be a little larger than indoor pieces. If you don’t think you have enough room in any one area, make that area larger or find ways to make spaces do double duty. If you need space for a private retreat, sometimes you can create just the right feeling in a corner of the deck. Just moving a chair can make a small part of a larger area feel more secluded. If you have a pool, a pool deck can be a great addition. Pool decks not only provide additional space for lounging, but they also add a degree of privacy and security to any above-ground or in-the-ground pool. When areas with different functions will be used at the same time, you can separate them visually and physically by using planters, trellises, benches or by changing the decking pattern. Once you have a solid understanding of your deck dimensions, our deck resurfacing calculator can help you determine everything from exactly how much decking material you will need to which color and edge type you prefer. There’s a lot more to choosing a location for your deck than merely placing it somewhere at the back of the house. There is no rule that says a deck has to be attached to the house at all. You may find that a detached location provides the perfect spot for a natural getaway. If you plan to put the deck next to the house, take advantage of its exterior walls to get the best fit for your deck design. Also consider the features of your landscape — the slope of the grade, any existing vegetation and views can all impact the design of your deck and where you build it. There’s also no hard and fast rule that says a deck has to be single-level. If you have the space and the budget, a multi-level deck is an option. If you are dreaming of building a new deck, but your location doesn’t leave a lot of room for a large project, consider a ground deck. Sitting anywhere between 6 and 30 inches off the ground, ground decks are built on a level lot, do not require a permit and can create a beautiful outdoor space with less time and money involved. Because they are built low to the ground, they do require protection from moisture and outdoor elements, so sealing is important. Unleveled or sloping terrain can make your decking project more complicated but not impossible. Loose, sandy soil is great for gardening but may not provide the sturdiness needed to reduce erosion and provide lasting stability. Areas of direct sunlight, shade or wind can affect how frequently you use your deck and your comfort. Make sure you are mindful of the weather elements at play and make adjustments for climate control. An awning, pergola or umbrella can help to shield you from the elements or provide shade.